Free account is fully powered to create and use your own tests. It supports quick exam creation using import wizard based on PDF or XPS files. By creating and spreading your own tests, you can upgrade to any pricing plan free. With full power to create and use your tests. 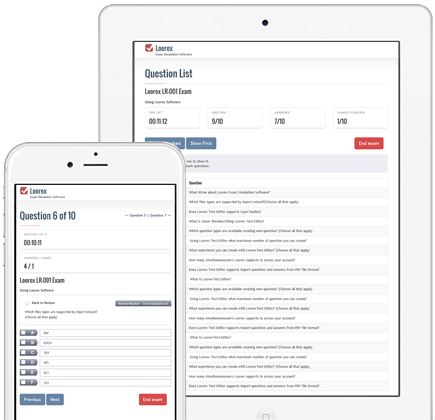 Create exams, tests or quizzes quickly and easily! 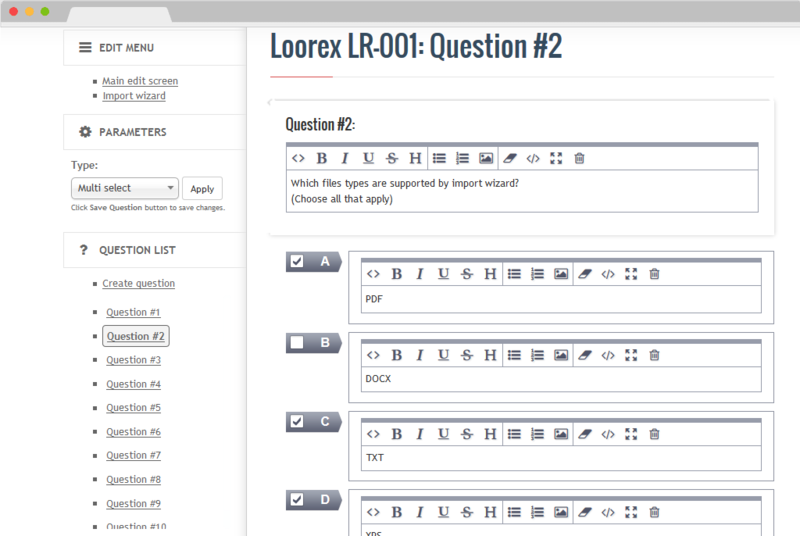 Loorex is Online Test Engine and exam related tools. It is modern web based application and therefore there is nothing to install. It works in any modern HTML5 compatible web browser and you are not limited with devices to run on. Access and use software anytime and from anywhere. Supports mobile devices, cross platform Online Test Engine runs on variety of different devices. Online Test Engine provides possibilities to put users in same environmental conditions as during a real certification exam alongside it can be used as a Certification Engine to secure and verifying real knowledge of tested subject. Allows importing your existing tests in PDF/XPS file format in a few clicks. Test Editor is a web-based tool that allows you to build, embed, and manage your own exams, tests or quizzes quickly and easily. Free account is fully powered to create and use your own tests. Online Exam Simulation is available for all tests imported from .ote files. We love when people create new tests and spread them. You will get bonuses for each use of your tests. Bonuses can be used to activate any of our pricing plans! On the Internet you can find thousands ready to use tests of different subject and all of them are free to use. Our import wizard allows you to quickly create new tests based on different widespread file formats, such as PDF, XPS and TXT. Try and you will love it! Are you tired of question duplicates? Use our compare utility to automatically find duplicates and create your own test, which contains only unique questions. Our Test Engine is fully compatible with modern mobile devices. You can take online exam simulation just on your smartphone. Loorex is modern web based application and therefore there is nothing to install. Unlimited devices to use. Access and use software anytime and from anywhere. Feel the power of our test editor, which allows you to create and edit various types of tests. Lot of settings and possibilities, unlimited question number. You can embed our test engine to your website! Your website users will have a free opportunity to evaluate themselves not having to leave your website. 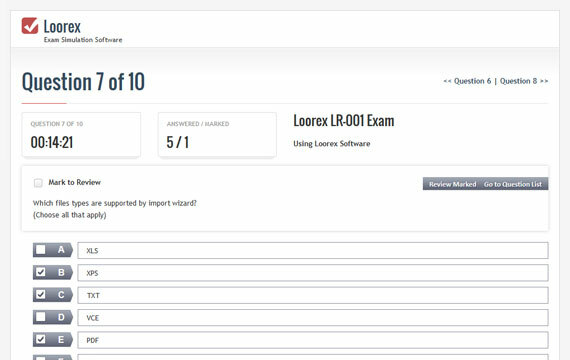 With Loorex you can raise your score, increase confidence and be fully prepared to succeed. This Simulator engine allows you to prepare and practice in a realistic environment. Moreover, I can definitely confirm that this is truly the best simulator on the market. Thanks Loorex team! This website is excellent; I was pleasantly surprised to know that there are techniques to further increase and consolidate my knowledge. The interface is intelligently done to help in learning properly. Now I know where to come in the future. Thank you for all the work you have put into developing this application. 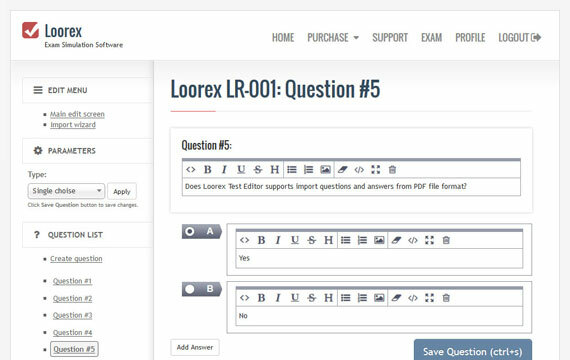 Loorex Software makes studying simple. It helps you manage your time and learn quickly any study material. You will be comfortable with the format by taking timed Simulations that looks and feels exactly like the real thing. I am very appreciative and will be back to Loorex for my next preparations soon. Thank you! FREE account have a full power of creating and managing your own tests. It supports quick test creation using import wizard based on PDF or XPS files.